Leonard's birthday rapidly approaches. We will send him an email birthday greeting about our bench project with the names of the contributors. You are the folks who made this project possible. 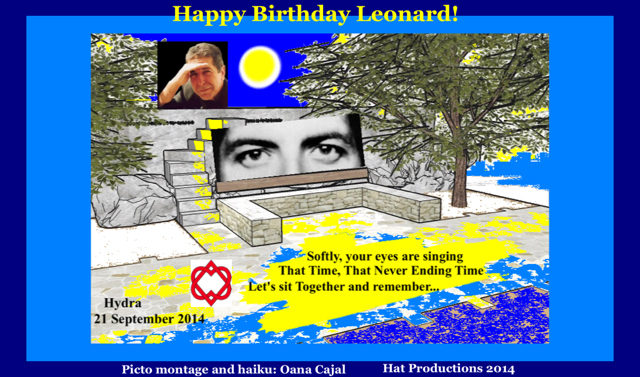 So, if you'd like to write a greeting to Leonard, not just wishing him a happy birthday but telling him about the bench project and what you feel the intent is behind the gift, we will select one and use it as the email birthday greeting to Leonard. From what we understand, Leonard is aware of the project so your explanation need not be long. Keep it simple and speak from your heart would probably be best. For the birthday greeting selected, we will use your name as the speaker for all of us. "A THOUSAND BURNING HEARTS" , longing to sit with you ,on YOUR bench, the mind embarked in some sort of a magic dance,on your words and the ebb and flow of moving waters. "Only Mystery allows us to live, only Mystery." on behalf of your friends on the forum we present you with this stone bench as a tribute in your honour for your 80th Birthday to be used by your family and the people of Hydra for generations to come. It is our hope it will be a place of refuge and a sanctuary to take a moment to breathe and relax and just BE. This spot was chosen as a resting place and destination overlooking the sea on Hydra. Thank you for all the years of songs and music you have brought the world and for Being You! Last edited by mutti on Sun Sep 14, 2014 8:55 pm, edited 1 time in total. The bench is recognition. It signifies our love for you. It is situated in a place very dear to your heart. Some of us have followed in your footsteps and made pilgrimage to Hydra, others like me have not. We decided to mark your 80th birthday here because you believed in something here, you took refuge from the world here, you evolved here. And you wrote, and then later sang, to the very foundation of our souls. I, and all of the Leonard Cohen Forum send you heartfelt warmth and true appreciation for the inspiration you have engendered in us all. 'The Cohen Bench' is our very proud way of saying, 'Thank you Leonard'. In honor of your work and its enrichment to all our lives may this firm foundation be a place of presence, appreciation and contemplation for generations. Happy 80th Birthday from your friends. Your little paradise Hydra. - The relentless sun is on her way to the horizon. Time for a light meal in a taverna. Greek merides? Roasted marides or better Barbouni? Some glasses of Retsina or red Tsantali? Ena café hellenico, varigliko, and a Botris cognac? trees providing some shade - and a light breeze is caressing your face. It is YOUR bench for good, the LEONARD COHEN BENCH! - Our birthday present to you. Efharisto para poli for so generously sharing your thoughts and feelings with us in your books, poems and songs. No words can properly express our deep gratitude. dar wrote: In honor of your work and its enrichment to all our lives may this firm foundation be a place of presence, appreciation and contemplation for generations. I like this very much. It's concise and effective, and it expresses at least my feelings the right way. I think we shouldn't be long. I like this too; it's short and completely relevant. Which Birthday greeting was selected?